New Orleans Reading an surprisingly good article in the New York Times about the union fight in Indonesia against the great mega-retailer Carrefour to win rights for contract workers that they thought they had gained in a strike earlier this year, I was struck by how blind we all are to similar worker exploitation right in front of our eyes every day. We are not blinded so much by ignorance as by ubiquitous corporate deceit and sleight of hand. The worker smiling across the counter, hauling our garbage can, delivering our prescription, telling us about the traffic on the way from the airport, and in many other situations is not really working for the company whose name is on their uniform, but often an exploited contract worker in disguise. Recently talking to Ken Paff, the long time organizer for Teamsters for a Democratic Union (TDU) about any new organizing being done by the Teamsters, he was incredulous when I told him that Waste Management and many other companies really only employed the drivers on those privatized municipal sanitation trucks, because the laborers on the back end of the trucks were almost always contracted, casual and temporary workers. I knew because Local 100 has represented them with all of the garbage companies in New Orleans, Dallas, and elsewhere for years. It’s part of the business model, pure and simple. Offload the workman’s compensation liability on someone else because running in traffic behind a multi-ton truck is very dangerous work and besides who knows (cares?) what they might be paid for the work and the risk. Just like the Indonesian worker was quoted by Sara Schonhardt in the Times, “New employees who are young and ready to enter the work force will take whatever pay they can get…” and this sets the stage for exploitation obviously. Taking a cab into the city from the Metro Airport in Detroit I saw an envelope between the cabbie’s seats that was marked UAW. I asked him if he was represented by the autoworkers union. He was on the organizing committee of a difficult drive to organize the company with the UAW’s help, but they kept being rebuffed as “contract” workers. To same “in name only” beggars the question of the weaknesses of labor laws for this burgeoning sector of the domestic and global workforce. Not all associates are created or treated equally it seems. This is a critical issue that could easily be solved either by worker action or by closing the loopholes in the labor laws. It would be wonderful if both workers and lawmakers could combine to fix this problem in many countries, though that seems like a Christmas kind of wish and too much to hope. New Orleans Ok, one hand is clapping. There was some progress on student loans under the Obama Administration. The huge billion dollar scam that was subsidizing banks was kyboshed and federal loans were taken away from the private sector. Furthermore, President Obama won some limits on payments and implemented some forgiveness programs, especially for public service. Clap! Clap! Clap! But, let’s not pretend there’s a solution by any means, as costs continue to rise and debt for many continues to compound. I was reminded of all of this as I watched an excellent trailer for a coming documentary called “Default: The Student Loan Documentary.” The highlight (lowlight?) was watching one young person after another state obvious: they took out loans with the dewy eyes of youth buying the American myth that riches were on the other end of the education door, and are now drowning in debt and compound interest charges while navigating well paid jobs, professional jobs ($35000/year) that provide living wages but can’t pay loan shark interest and loans. It has ceased to be a surprise to me that inevitably if we both to look at any powerless constituency like the young, the old, the poor, or immigrants, it is a certainty that we will find financial predation sucking the citizen wealth out of any groups that can be easily exploited by their acute need or their ignorance. One of the functions of government is to protect and defend citizens against such practices, but in our current ideology too many blind eyes are turned and banks and others prey without restrain or regard. 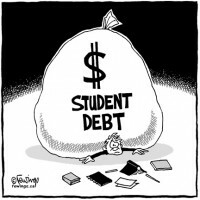 Rob Lieber in the New York Times talked about two new student loans being offered by U. S. Bank and Wells Fargo, and his column was almost as sad to read as watching “Default” had been. Like sub-prime housing loans and refund anticipation loans, I cannot deny that there isn’t a need and market for private student loans. Part of the reason is that the excellent (3.4% interest) federal loans just don’t carry enough of the weight involved in paying for modern higher education. 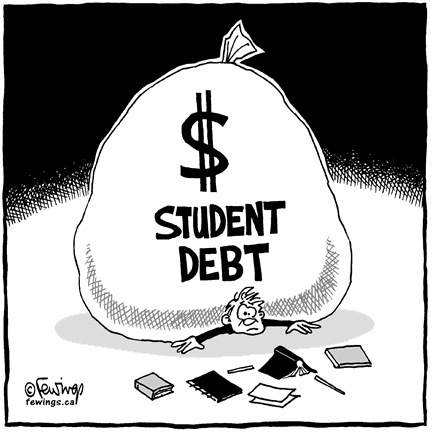 All of which opens the door for these absurdly dangerous and risky loans to teenagers desperate to go to college. Fixed interest rates are a good thing but U. S. Bank offers one for 15 years at 7.8% or with an upfront fee, 8.46%, which right now is knocking on the door of usury, frankly. Wells Fargo fixed rate product moves from 7.29% to almost double that at 14.21 percent if you are a working stiff trying to go to community college or trade school, which enrages me! Add to both of these products the likely certainty that a teenager will have to have a co-signer, usually from their family, and it is easy to see how the whole family could go down on the false promises made at the altar of better incomes through higher education. This is only a fix in the way that the term is used with hard drugs rather than higher education. Lieber is right to point out that too few students and their families follow the implicit instructions of the federal program and most advisers to first use up the $31,000 that will come at a cheaper vig from the feds and if you need more, realizing that you may be over your head, and need to look at a different school with more affordable debt. The snowball currently has more chance in hell than we have of getting Congress to expand the federal program to a higher, more realistic level. Everywhere we read of layoffs and cutbacks at even the relatively more affordable public institutions across the country who are being driven to layoffs and price hikes. The student loan situation is a travesty. What kind of a society refuses to protect its young?